The 12 beautiful 4.5 STAR Holiday Apartments are BEACHSIDE with traditional Aboriginal decor and all the modern conveniences and amenities you expect. 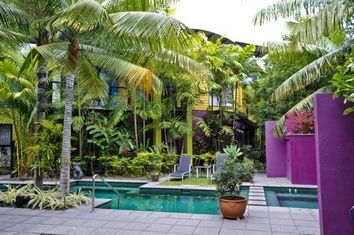 Beachside, yet close to the Port Douglas Village centre with its restaurants, art galleries, shopping, Marina Mirage, as well as 2 world championship golf courses - 40 minutes from Cairns International Airport along Australia's most scenic drive. 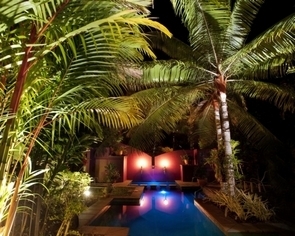 PORT DOUGLAS, AUSTRALIA "THE CHOICE" for a tropical Australian Holiday. Port Douglas is the perfect base from where you can delight in the natural wonders, adventure and spectacular scenery for which Tropical North Queensland, Australia is renowned. The Great Barrier Reef, the world's largest Marine Park is just an hour's boat ride from Port Douglas Marina - the closest departure point to the reef from anywhere on the Australian eastern coast. Scuba diving, snorkelling, fishing, sailing or just cruising on one of the Wonders of the World - a lifetime experience. The Daintree Cape Tribulation Rainforest, primeval, pristine and ancient containing 1000's of species of flora and fauna that are indigenous only to this area and not found anywhere else in the world. 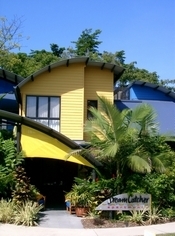 Daintree Australia interpretive bush hikes, 4WD safaris, Daintree River cruises, eco-tourism at it's best. The world's oldest tropical rainforest that is being preserved for all to discover and enjoy. 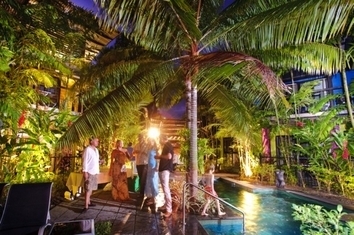 Port Douglas is an incredible holiday destination where the choices for fun and adventure are endless. An unforgettable holiday destination for creating lifetime memories. In a uniquely Australian touch, Aboriginal décor complements all of the apartments. This traditional Australian theme is featured throughout the property, as hosts John and Annie share their interest in indigenous Australia. This apartment is fully self contained with 57m2 floor space, air conditioned, separate bedroom with king or queen size bed, ensuite bathroom with seamless glass shower, spacious comfortable lounge area, 4-seater dining, kitchen with microwave and dishwasher, laundry facilities in your lobby, balcony or patio overlooking lush tropical gardens. This apartment is fully self contained with 47m2 floor space, air conditioned, queen size bed, ensuite bathroom with seamless glass shower, spacious comfortable lounge area, 4-seater dining, kitchenette with microwave, laundry facilities in your lobby, balcony or patio overlooking lush tropical gardens. This apartment is fully self contained with 110m2 floor space, air conditioned, 2 x separate bedroom with king, queen o2 2 x single size bed, 2 x ensuite bathroom with seamless glass shower, 2 x spacious comfortable lounge area, 4-seater dining, kitchen with microwave and dishwasher, laundry facilities in your lobby, 3 x balcony overlooking lush tropical gardens. Complimentary Broadband hotspot. Fax available for use at reception. Check-in at reception, cnr Reef and Helmet st. Check-in time is at 1400, early check-in by prior arrangement, subject to availability, costs may apply. Late night check-ins, we require an estimated arrival time as reception closes 1800. Night phone is at reception to notify night manager of your arrival. Extra guest bedding is available at $25 per night, limits per apartment. Cots for hire at $15 per night. Complimentary under cover parking is available. 1 vehicle per 1 bedroom apartment, 2 vehicles per 2 bedroom apartment. International and domestic flights are available into Cairns International airport. Majour car rental companies operate directly from the airport. Self drivers should follow the signs to Mossman/Port Douglas north along the Captain Cook Highway until you reach the main entrance to Port Douglas (approx. 50-60 minute spectacular coastal road). Turn right into Port Douglas Road, then turn right at the second roundabout, Barrier Street which becomes Reef Street after 300m, you will see us on your left. Shuttle bus, taxi and luxury limousine services are also available, enquire directly at our reception for bookings, including all barrier reef, snorkling, diving and daintree rainforest tours. Port Douglas is Australia at it's finest. Fringed by the spectacular Great Barrier Reef and World Heritage-listed rainforests, the township is a delightful blend of modern style yet tradition charm. 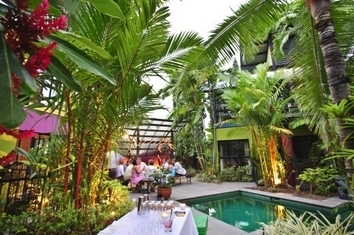 Hosts and staff are locals in Port Douglas for years and are extremely familiar with the region and its diverse tours and attractions. They are more than happy to provide information and guidance on the most appropriate activities to help you make the most of your Tropical North Queensland holiday. 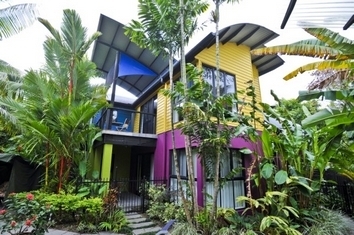 Visit the world's oldest rainforestDaintree Rainforestlocated in the Wet Tropics World Heritage Area. This 894,000 hectare rainforest is the home to thousands of species of birds and animals, as well as a spectacular array of flora. A range of tours is available.